Project Little Spark enjoyed working with Mr. Coleman’s class at the Bell School for the Deaf to prepare our next shipment of donated supplies. 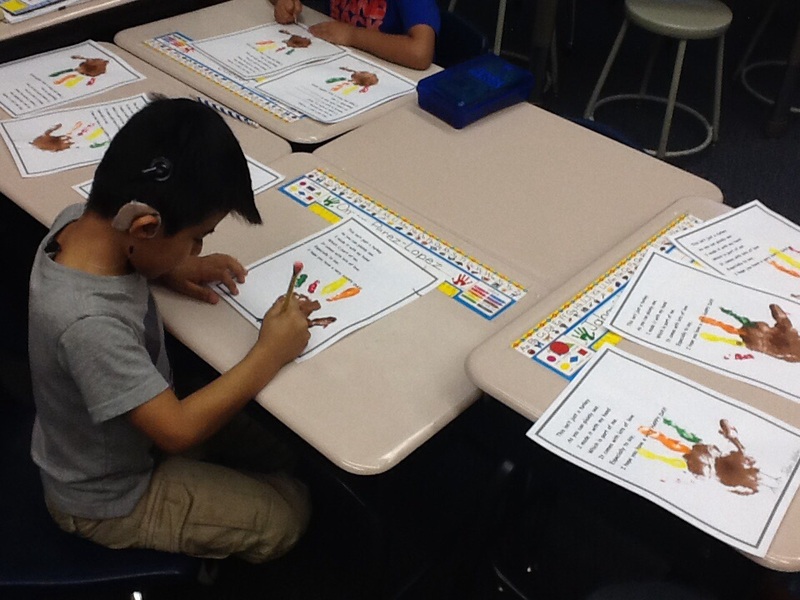 The boys were quite serious about the color choices for their art projects! Mr. Coleman and his kids learned about St. Vincent and the Grenadines (SVG) as well as their global peers from The School for Children with Special Needs (SCSN) in SVG. They were excited to send their peers well wishes. When asked to predict how the children might feel when they opened their package and knew someone in Chicago was thinking about them, one of the boys signed, “happy smile happy good”. We decided that sums up the feeling pretty well! We then had fun making art work to include in the Fall shipment. Thanks to all who donated supplies over the last few months. We collected supplies valued at ~$300 to send to SCSN in this shipment. Your ongoing generosity and support are very much appreciated. To quote one of our kids : “thanks for the giving”, and, as always, keep sparking on! 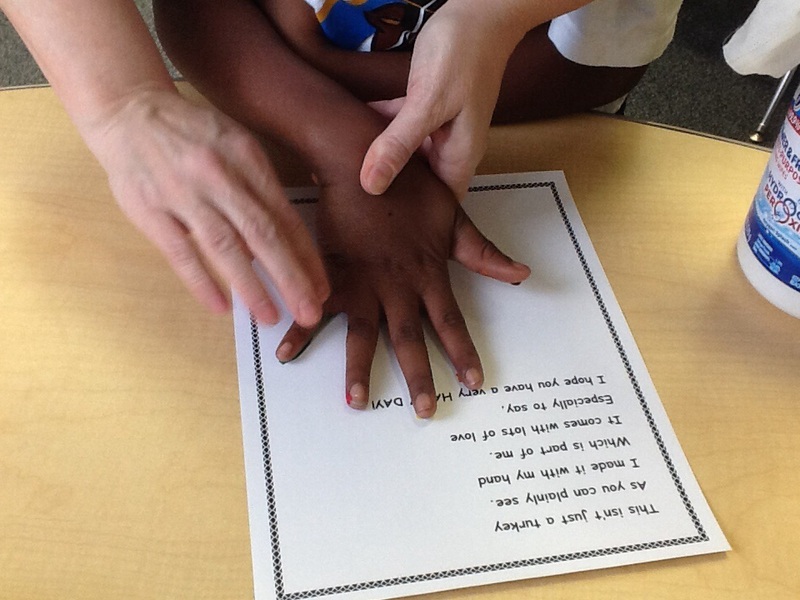 An SLP shows students with special needs how easy it is to help others who live far away but face similar challenges. Helping others benefits everyone—helper and recipient. And that includes children with disabilities, who themselves receive extra support, says speech-language pathologist Jeanine Jesberg. That’s the thinking behind Project Little Spark (PLS), which she launched last year. 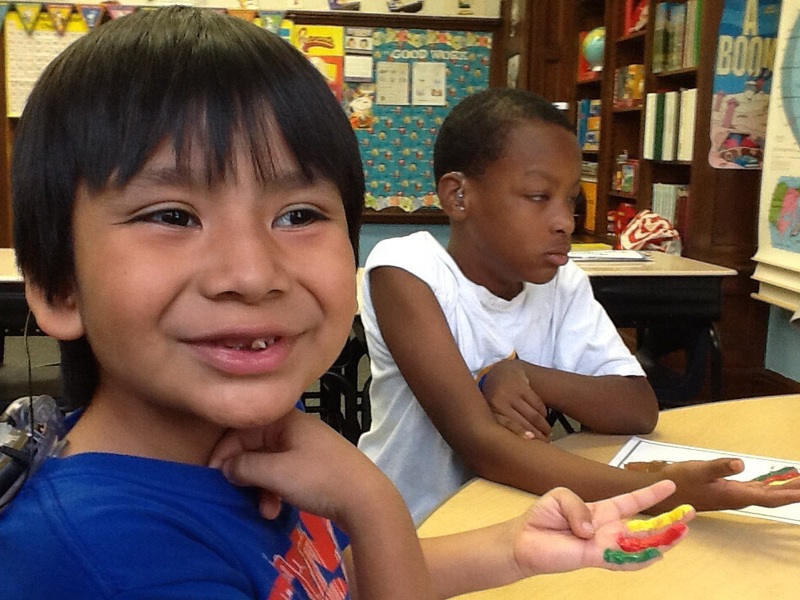 PLS matches special education students in Chicago with their peers in the Caribbean. A frequently quoted line from “The Divine Comedy,” Dante Alighieri’s epic poem, inspired the name of Jesberg’s fledgling nonprofit and serves as its mission statement. The most common translation: “From a little spark may burst a mighty flame.” This founding philosophy is proven each time Jesberg visits another group of students and sees their eagerness to help collect and ship school supplies to other kids who face similar challenges. The SLP, grant writer, research administrator and nonprofit consultant worked for years to help other groups figure out the “how.” After running a private practice that employed about 15 other SLPs, Jesberg landed a research position at the University of Chicago’s Early Childhood Intervention Center. She used her business background to make her program financially profitable, while completing training in research administration and nonprofit management. Jesberg soon became the center’s director—the first SLP to hold the position—and eventually rose to executive director for the university’s Institute for Mind and Biology. The job was going well, “but I felt myself searching for what I really wanted to do,” Jesberg says. 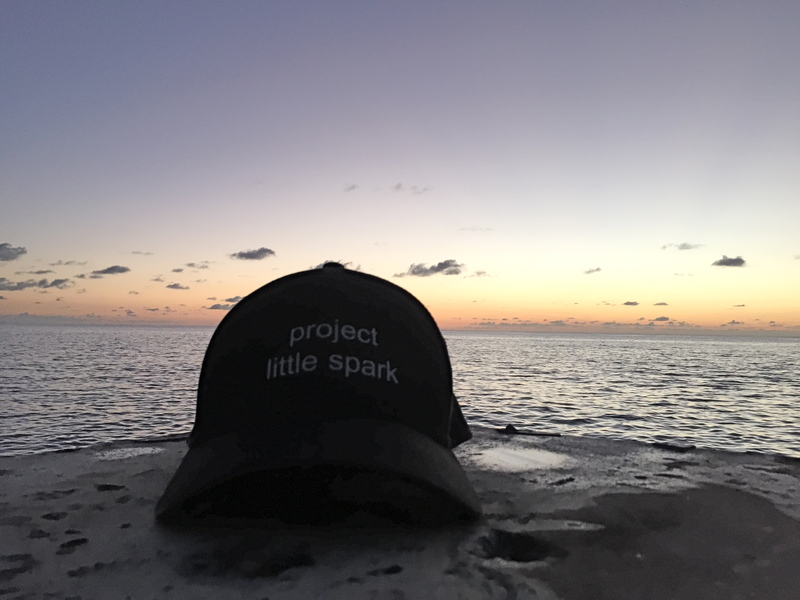 “What can I contribute to the world?” After some research to find out what might be missing in the realm of supporting children with communication or other disorders, she decided to launch Project Little Spark. Jesberg left her full-time position, but she continues to consult for other organizations as well as perform research administration work for Northwestern University. Because of her consulting and administration work, she doesn’t need to draw a salary from PLS. Instead, she devotes all grant money, fundraising efforts and individual donor support to pay for packing and shipping. The Chicago-based students and their teachers solicit and collect the new school supplies to fill those shipments. Once, after giving a presentation and showing photos of children in the Caribbean, a student ran up to Jesberg excitedly making the sign for “same” over and over again. He’d noticed a child in a photo wearing the same hearing aids he wears and couldn’t wait to send her something. In addition to soliciting donations, the students add drawings, letters, photos, videos and other personal items. Jesberg is especially touched when a student gives something of their own—usually something of significance—like a favorite superhero pencil case or a new box of sharp crayons. Collections of new school supplies flow fairly easily. One anonymous donor regularly gives new books, including textbooks, classic tales and even a series about Caribbean children. Other donors drop off leftover items they can’t use but that recipient schools desperately need, like boxes of unused chalk. Students gather the supplies, count and sort all items, add personal messages and prepare boxes for shipping. Jesberg lived in the Caribbean for a year and understands how things work “on island time.” This experience guides her as she organizes logistics for PLS. For example, international shipping remains one of the organization’s biggest expenses and most complex processes. However, thanks to her familiarity with island logistics, Jesberg knows how to make sure packages get to partner schools intact and without delay. Some effects of organizing these student-to-student giving projects surprised Jesberg. She predicted local students would expand their communication skills as their worlds expanded. What she didn’t expect—or request—was for recipient schools to form ongoing relationships with their U.S. peers by sending back letters, drawings and photos. 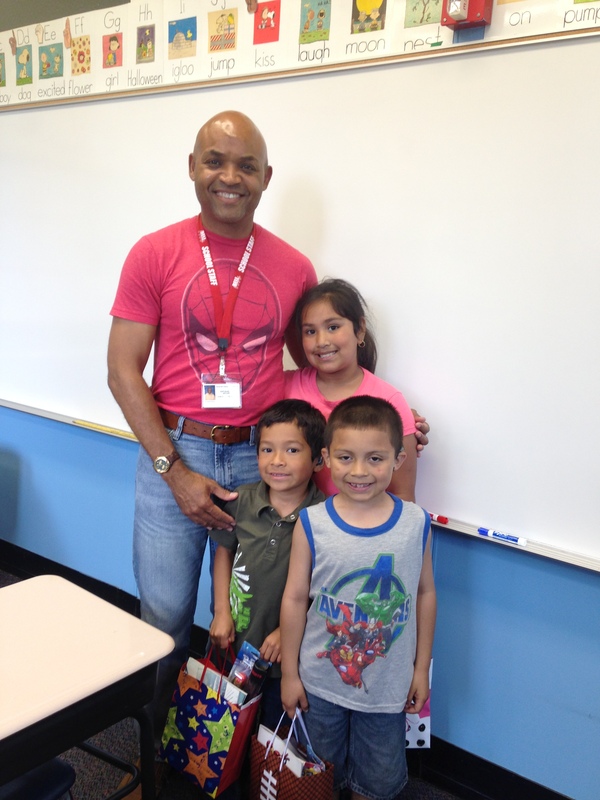 In addition, teachers from the Chicago schools report improved behavior from the students involved with the project. When they tell Jesberg stories about random acts of playground helpfulness and frequent voluntary sharing, she is determined to continue fanning the flames of kindness ignited by Project Little Spark. Jeanine Jesberg launched her own nonprofit, Project Little Spark, and she consults with other organizations to help them find funding, successfully apply for grants, and manage their organizations. She recently started a new initiative called The SHED Project, a Speech and Hearing Early Detection (SHED) clinic in St. Vincent and the Grenadines. Below she shares her favorite resources to help get and keep an organization funded. The Pollination Project Foundation exists solely to help people start their own nonprofits by making seed grants of $1,000 each. Jesberg used one to found Project Little Spark. The Foundation Directory shares searchable details on more than 100,000 U.S. foundations, including their funding interest areas, to help organizations find a funding match. Non-profit Guides provides grant-writing tools for nonprofit organizations including a sample grant proposal, inquiry letter, proposed budget, applications and links to grant-writing resources. GrantProposals.com gives information on the elements of a proposal, general guidelines and steps to take before writing your proposal. The website also lists funding resources. The Foundation Center developed a free online course on finding the right donor partners and submitting a successful funding proposal. The Minnesota Council on Foundations offers a detailed outline on how to write a successful grant proposal. Our SHOEBOX audiometers have arrived-small enough for remote travel and set up as well as Henry approved! The SHED Project is supported in part by funding from The Ella Lyman Cabot Trust. Project Little Spark enjoyed a fun day with special needs students from St. Croix, USVI (United States Virgin Islands). We’ve collected supplies valued ~$100 in the USVI and learned about our Caribbean neighbors in St. Vincent and the Grenadines (SVG). The children made cards for inclusion in our New Year’s shipment to The School for Children with Special Needs in SVG. Thanks to our donors for the funds to cover shipping costs and best wishes for 2016! Greetings from St. Croix, USVI! We recently submitted a progress report about our project’s work to date to The Pollination Project and are happy to report it was approved! We are grateful that we received the second installment payment to support the growth of Project Little Spark as a non-profit organization. Project Little Spark received a check for $84.07 from our supporters who changed their shopping for good at iGive. THANK YOU!! Please consider supporting Project Little Spark when you shop online after downloading the iGive button. Every dollar helps offset the cost of shipping supplies to partner schools After you download the button, be sure to also bookmark http://www.igive.com/amazon in your browser to make shopping at Amazon.com easy. What is iGive? It’s a free service to causes and members. Since 1997, iGive has grown to 350,000+ members supporting 50,000+ causes and raised almost $8Million! iGive really is as simple as it sounds. iGive members can generate donations by shopping at any of our 1,500+ Stores. There are no costs, obligations, nor any hidden fees. You don’t need to enter any codes, notify the store, or iGive. It’s all automatic! Shopping via iGive is essentially a store rebate program where iGive members have the opportunity to donate their rebate to their chosen cause. When iGive members shop via our special links, an “iGive Cookie” is assigned to your browser. This tells the store, “Here is an iGive Member” using a meaningless member ID number. The store reports back with this number and the amounts for the donation to your cause. iGive never have access to any payment information. You should see the tiny iGive Button that looks like a seed in your browser. You will see the “iGive On” Button the lower right corner. This means you are good to go! Shop as you normally would. Some stores require a confirming action that you want to donate. If you see a large red iGive drop down telling you that you need to confirm your donation, please click it to continue. When you successfully link to a store via iGive.com, your visit will be immediately posted at http://www.iGive.com/html/storevisits.cfm and visible in the “You Recently Visited” header box on the iGive.com site (you may have to refresh the page). Click on the “iGive On” Button for available live feed of coupons and to review any exceptions. Supplies are being collected in Chicago for our next shipment to our partner school in St. Vincent and the Grenadines. We are also happy to report we’ve established a new relationship with a school in the USVI and they have already provided school supplies to include in the next shipment. Sparking on across the sea!